FassQueen has done it again! 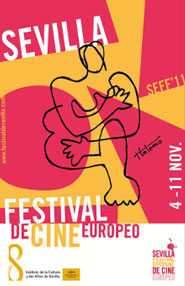 Steve and Michael were both awarded for Shame, at the Seville European Film Festival. "to approximate a complicated moral issue with skill and compassion and make a film that is exciting, poignant and very human. " "to cause a huge sympathy and respect for the character he plays and to recognize one of the largest new actors in contemporary cinema." *Ex Aequo means that Michael essentially tied for best actor with August Diehl, for if not us, WHO? Michael and Steve are busy boys this year, Shame continues to make an impact wherever it's screened. This film continually impresses audiences and juries alike. Fassinating Fassbender is so happy for Michael's and Steve's success! I look forward to seeing how the rest of award season plays out, will AMPAS follow suit? On a side note I know a lot of Fassinators are interested in the Jim Jarmusch Vampire flick. Michael recently said, “I’m not sure what’s going on there, to be honest,”. “Nothing is set in stone yet for next year. Until I’m on set and working on it, I’m not going to sort of say anything about it.” but he's still interested. I hope this film gets the green light, Michael would rock so hard as a vampire. Good for them! The Academy better recognize that Michael deserves an Oscar. Great first Post Dionne! sorry for the editing, there was a formatting problem. I'm glad you found out about Seville, I was clueless. @Simone Thank you very much, I'll get better with time. More awards, more recognition, more success. I just laughed so hard, I agree! I can't imagine who wouldn't want to be bit by him? Good job Dionne! I don't see this anywhere, you've got some serious Fassy finding skills.